– Glimple of Central Vietnam with Unesco World Heritage sites: Phong Nha cave with 7 best in Vietnam, Hue – one of Vietnam’s Capital and Hoi An Ancient Town. Arrive on early morning in Dong Hoi. You are picked up by private transfer to the hotel. Check in hotel. Free for your own leisure to enjoy beach in Dong Hoi. *Early check in is upon on availability. Board a boat and cruise along the river to Phong Nha Cave. The deeper one penetrates, the more magical are the natural aspects of the cave. After 700m, a large dry passage appears, allowing you to discover the cave on foot for a further 500m. You will also have a chance to explore the remains of Cham Altars and the inscriptions inside. Transfer back to hotel.Overnight in Dong Hoi. Drive to Hue with a stopover at historic Khe Sanh Combat, Ho Chi Minh Trail, Dong Ha Town, Rock Pile. Trip to Hue in the afternoon via Quang Tri Citadel. Arrive Hue about 6pm in the afternoon. Meet up with your local tour guide and driver at 8.00, start a day to visit Hue: the Citadel, Tu Duc Tomb, Garden House in Phu Mong – here you know more about the old-style hose in Hue, visit Hat and Incense stick making village. Lunch in local restaurant. 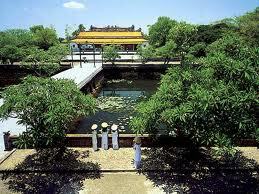 Afternoon, visit Minh Mang, Tu Duc Tomb and Thien Mu Pagoda. Boat trip on Huong River and enjoy sunset on the river. Back to hotel. Overnight in Hue. Visit My Son – one of the UNESCO Heritage Site in the Central to explore about Cham Culture. Transfer back to Hoi An Town. Afternoon free for your own leisure. Overnight in Hoi An.